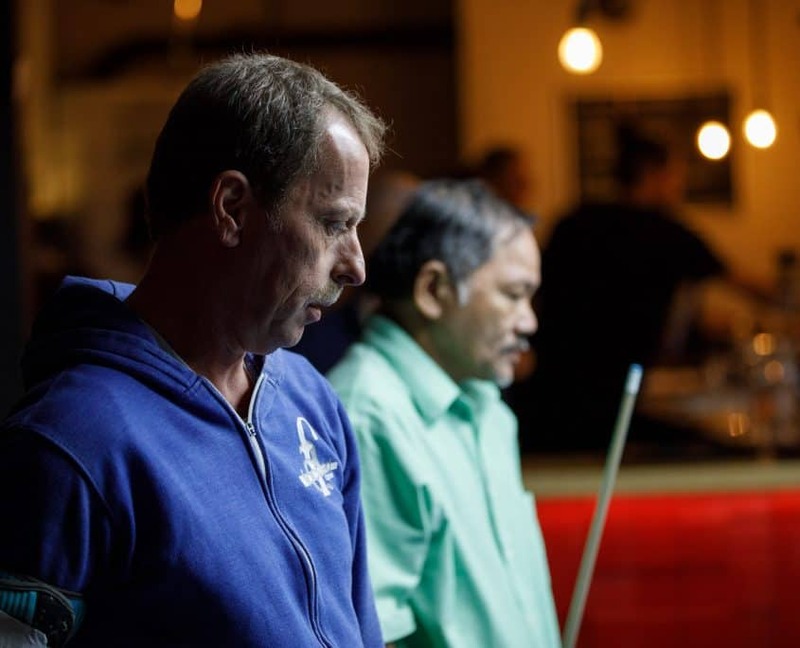 When Achim Gharbi of the Touch German Tour called us in October 2017 and offered to bring Efren “Bata” Reyes, Earl “The Pearl” Strickland and Francisco “Django” Bustamante to the Bata, we had to think for exactly 13.5 milliseconds to come to the conclusion that we as the founders of Bata Bar & Billiards had to do this. We hesitated a bit until the final decision – the effort in terms of organisation and finances was quite something. And, to be honest, we weren’t quite sure how strong the demand would be in the hard-to-impress Berlin pool scene. As we soon found out, we couldn’t have been more wrong. Finally we confirmed the event for January 14th, 2018 after several guests promised to buy one of our six VIP packages. The early bird tickets sales showed us how exited the Berliners actually were: After four hours we sold all 60 early bird tickets and four of six VIP tickets. All right, so people were interested… Quickly we decided we could go all-in then: We needed professional seating with bleachers which would expand our capacity to 100 seats and space for 60 people in the standing area. A big “Thank you” goes out to my business compañero Michael (yes: “Heidi”) who managed to find a top notch partner for the seating material and took care of everything from A to Z to make sure that the arena and the backstage area looked like how it finally looked like: freaking awesome. The tickets almost sold themselves: People know the Bata Bar & Billiards now, to my knowledge we were the first of the tour stops to sell tickets and of course Berlin is always worth a visit for people from outside. International visitors came from Denmark, Poland, Great Britain and the Netherlands, to name a few. The second stage of tickets sales went as smooth as the first one: After a week we sold 90% of the tickets and were sold out weeks before the event. Fast forward: Just after another few weeks of stressful preparations the weekend of the event was finally there. 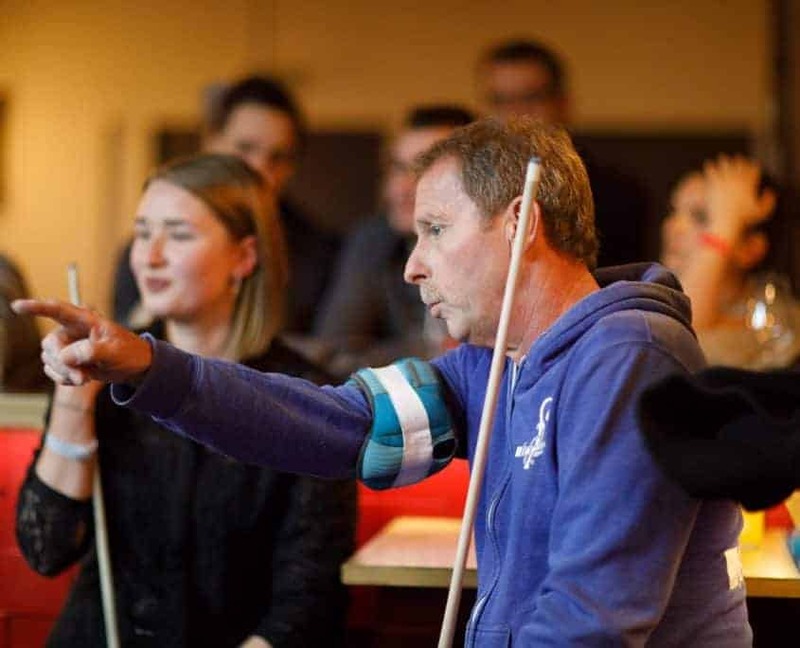 Efren and Co. being something different was confirmed by the nice fact that our Public Relations work finally bore fruit in the tough Berlin media ecosystem: The Berlin newspaper “Der Tagesspiegel” featured the event with a preview. It all started with the VIPs, so it was only right and proper that they would meet the stars first: At 3.30pm the legends entered the Bata with five anxious VIPs waiting for them who could barely open their mouths in the first few minutes. No problem, since Earl “The Pearl” Strickland had entered the venue who is never short of words. With a happy “That’s a 5 by 10!” he jumped on our Diamond 10ft table and was hard to get away from it for the rest of the night. In the following 90 minutes our VIPs (who finally found their voices back) played with the pros, got advice, learned some tricks, and had dozens of memorabilia signed, from an antique cue to a torn piece of Snooker cloth in a frame. Every VIP got a picture with the stars, too, as a memory to this once-in-a-lifetime event. 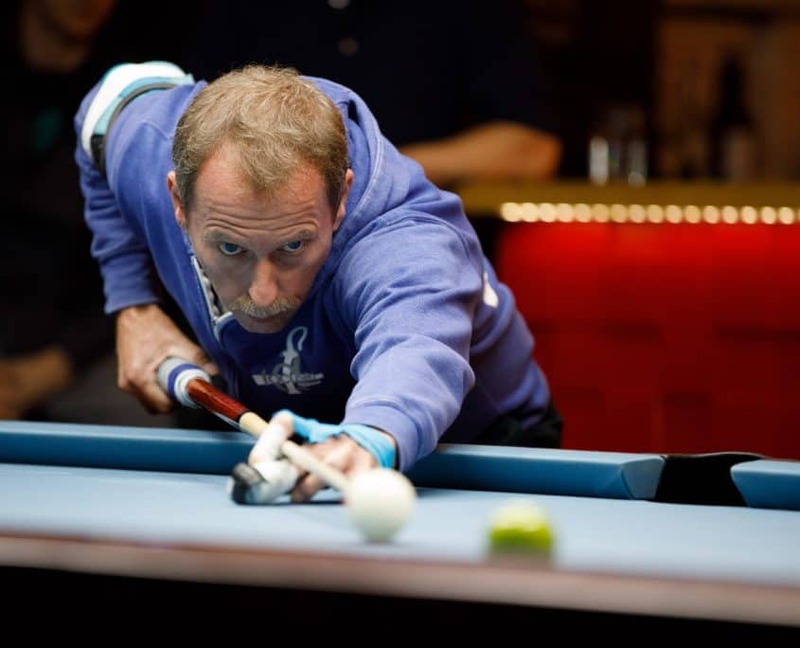 Talking about pictures: Thanks to our house pro Ralph Eckert who drags pool celebrities to the Bata regularly we got in contact with one of the best known and renowned pool photographers in the world: Markus Hofstätter from Austria. Markus, we’ve been thanking each other a lot over the last few days, let me do it one more time: Thank you for your great work which will make sure that we’re gonna enjoy the memories of this event for a long time to come. Markus didn’t just take pictures of the whole event (all pictures on this page are by him), but he quickly came up with an idea for a standalone project doing classy portraits of Efren, Earl and Francisco. They will be published separately – also on-site at the Bata. At 6pm the main event finally started: The fifth of eight total matches between Efren Reyes and Earl Strickland during this tour was up. This is where the livestream by the Touch team started, which is available on Youtube and Facebook, by the way. After a short introduction by me and a presentation of the sponsors Efren and Earl entered the stage. The audience went wild right away – one can barely see players of this level in Berlin. Earl quickly made clear in the first couple of racks (10-ball was the game) how comfortable he feels on a 10ft. Without Bata making a lot of mistakes, after a short while it was 3:0 in Earls favour. 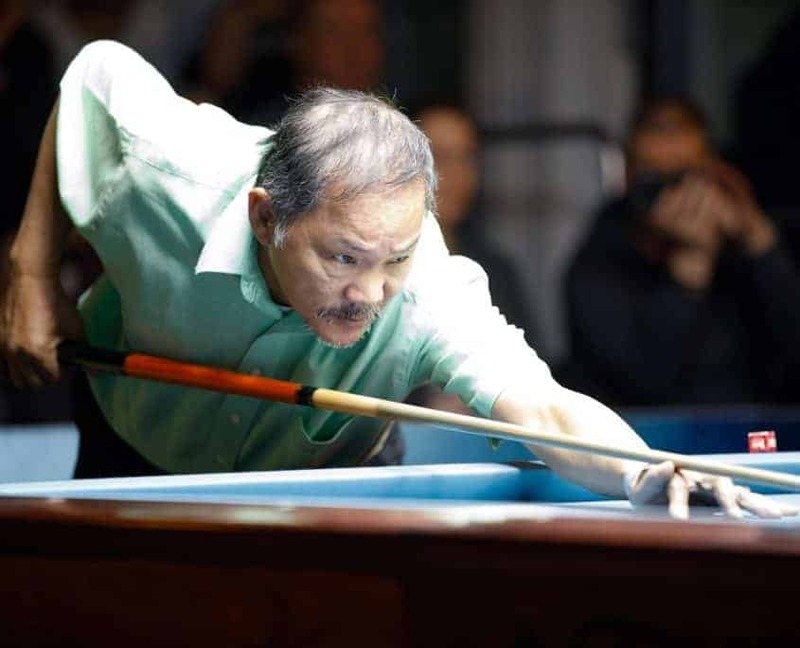 But Efren fought back and adjusted to the table quickly. With his outstanding touch he played perfect positional shots and caught up rack after rack until the match was tied at 3:3. He could have even taken the lead with 4:3, but rattled a difficult 8 which Earl took advantage of to take the lead again. After that it was all Strickland showing the powerful and dominant “Earl Show”, winning the set with a clear 7:3 score. It wasn’t Bata’s day. That didn’t bother the audience much, since they had seen world class pool on the 10ft. Unbelivable how well Earl is still potting balls. 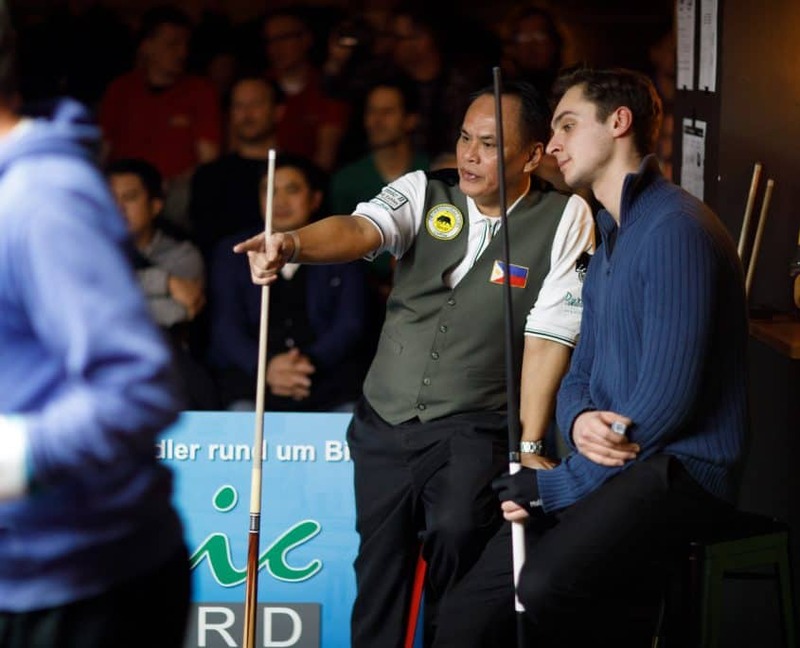 No surprise that he won the German Tour finals a week before in the German town of Sindelfingen (against 300 players with names like Ralph Souquet and Thorsten Hohmann in the field). After a signature session where our guests had everything signed but babys and body parts, the second highlight of the night was on. We invited three top young players from Berlin, Veronika Ivanovskaia (Female World Ranking ranked 18), Andre Lackner (multiple German Champion) und Sandro Zschunke (multiple Berlin Champion) to form scotch doubles teams with the three legends and play a little round robin format. The Berlin players agreed on who was going to play with whom and we ended up with the teams Vero/Earl, Sandro/Django and Andre/Bata. 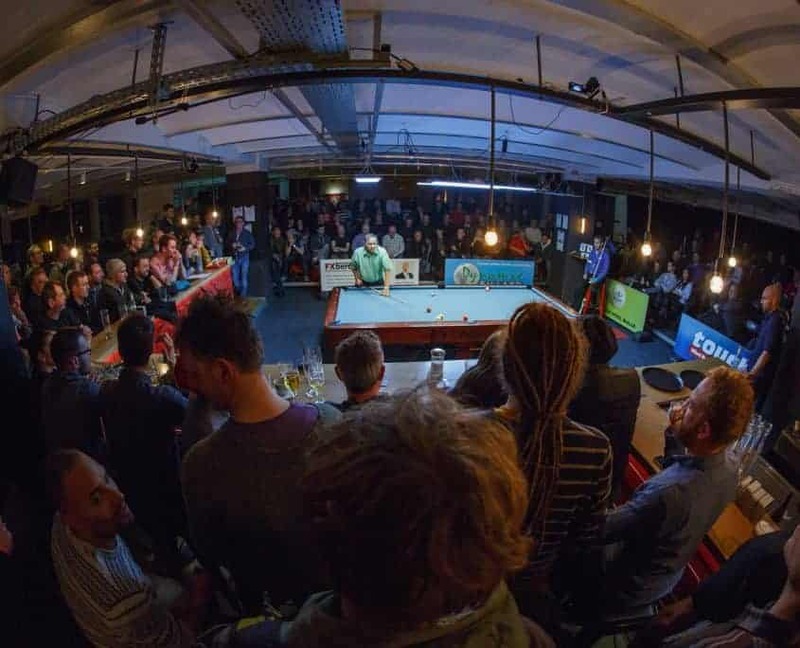 The format was close to the “GT Multiball” format that is played in a lot of events in Germany now: Per set there would be two racks of 10-ball, two racks of 9-ball and two racks of 8-ball. Every team would play both other teams. The team with the most racks won would be the winning team of our mini tournament. Every rack counted. The first match saw Vero/Earl face Sandro/Django. Whoever thought that the pros would have to drag their young team mates with them couldn’t have been more wrong. We witnessed fantastic runouts and tight safety play by the youngsters as well as the legends. And it was fun, too: Especially Django was in a cheerful mood and joked with his teammate, opponents and the audience. Earl showed a spectacular draw jump shot across the full table which almost got perfect position on the next shot at the other end of the table. 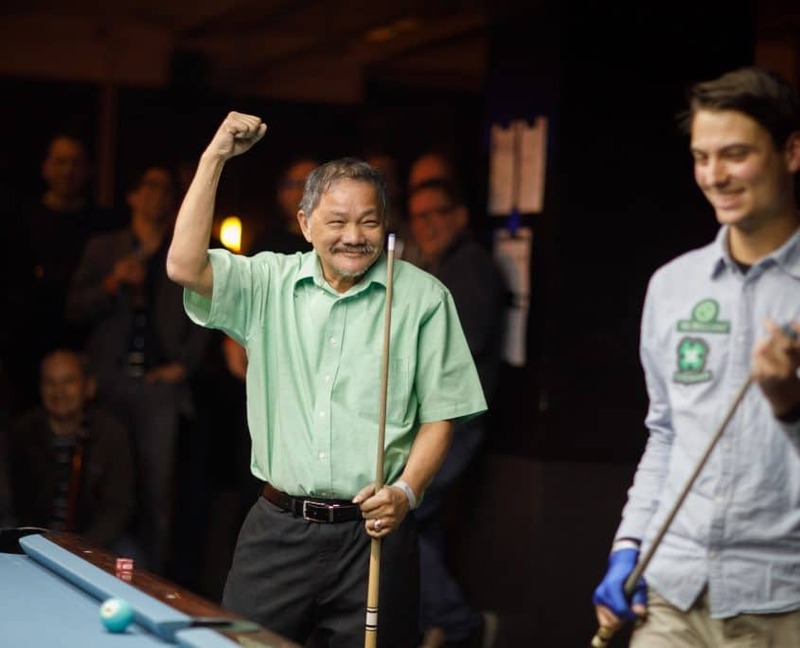 And a second time he amazed the crowd with a super thin cut on a 9 ball frozen to the rail. Both teams wouldn’t make it easy for their opponents which resulted in a final score of 3:3. Next match: Sandro/Django stayed at the table and would take on Andre and Bata, who where probably the strongest team in the competion. We would see if they could live up to the expectations. They could: They went up quickly 2:0 and 4:1 and wouldn’t give up this lead again, despite Sandro and Django playing a good match, too. 4:2 was the final score which took Sandro/Django out of the race for the overall win already. There would a real final between Vero/Earl and Andre/Bata. A draw would be enough for Andre/Bata, whereas a 4:2 (or better) in Vero’s/Earl’s favour would give them the overall win, since the direct result between two teams would count in case of the same number of racks won. And it got tense: Both teams showed great pool and had applause and laughs on their side after making great shots. Both teams played well together which ended in the best of all finals: With the score at 3:2 in Vero’s/Earl’s favour the final rack would bring the decision who would be the winner of the mini tournament. The game was 8-ball and the rack was a tough one. Neither of the teams had an easy layout, so they were trading safeties and tactical shots. No team wanted to loosen up and give their opponents a chance. Finally it was Vero and Earl who tried an aggressive move. Unfortunately, it didn’t work out and the table was open for Andre and Bata for an easy runout and pocketing the overall win in this fun tournament. One could see that the Berlin players enjoyed this once-in-a-lifetime experience and the legends also looked like they had a good time with the young guns. See the pictures below for proof. With this shot Earl too said goodbye and a unique night at the Bata came to an end. Again we’d like to thank everyone: our guests, the legends, the Berlin young guns, the Touch German Tour, the sponsors, Markus Hofstätter, Ilja Linkert for perfectly racking the balls every time and our great staff who (as always) made sure that our guests were taken care of perfectly. Thank you for everything and see you next time – whatever event that might be.